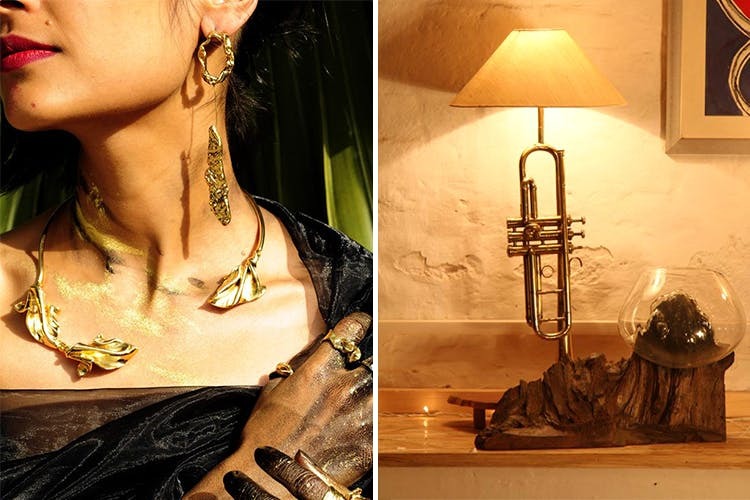 Contemporary, sleek jewellery as well as home decor items made from old watch parts, electrical fuses, cement, trumpets, wood and other industrial junk, Metallurgy takes upcycling to a whole new level. Started by Advaeita Mathur (who started her career with Tarun Tahiliani), the brand is all about creating contemporary objets d'art, but with a utilitarian twist. Metallurgy boasts of a handcrafted collection of ready-to-wear jewellery and accessories primarily in metal, played off by bits of cement, gears and other unconventional materials; anything Advaeita comes across and feels she can mould into something pretty and functional. Choose from chic coral earrings, sculptured rings, hardware rings, clutches made of leather and aluminium and and even some collectibles made of wood, metal and trombone lamps. They’re open to customisation as well. Their pieces are not the most easy on the wallet. But since they're all one-of-a-kind, we'd say that the investment is worth it. The designs are not mass-produced and hence, have eclectic value—they make for great statement pieces.